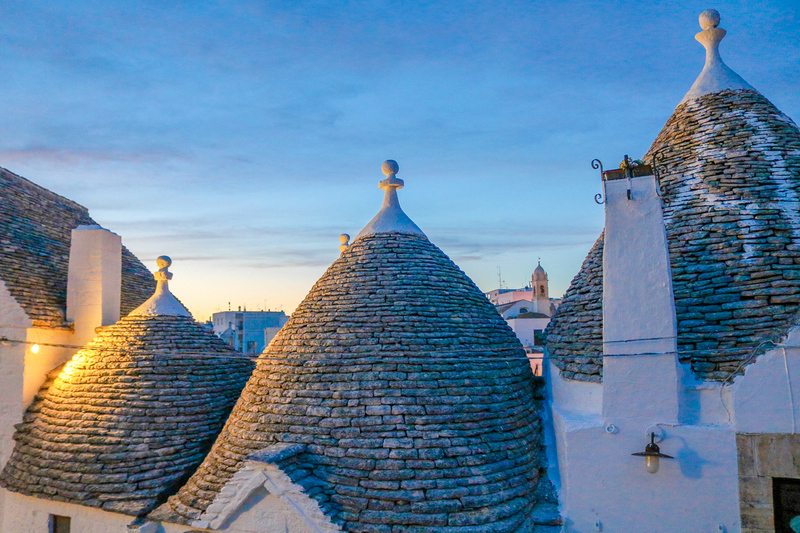 In my last post, I told you all about my dramatic entrance into Alberobello, which ended in a 2am visit to the emergency room! On day two in Italy, I woke up with a throbbing (but thankfully not broken) ankle, and an itch to know what the heck was outside my window. 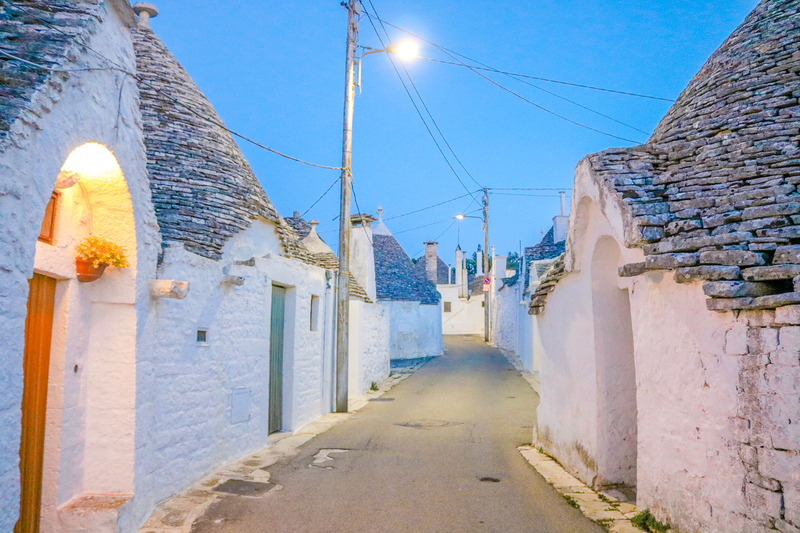 We had arrived in Alberobello the night before under a veil of darkness, and while I knew first hand that the ground in Alberobello was quite uneven and that my room was sticky-hot and cave-like, that was the extent of my Alberobello knowledge. So imagine my surprise upon opening my hotel room door to this view: Is this real life?! 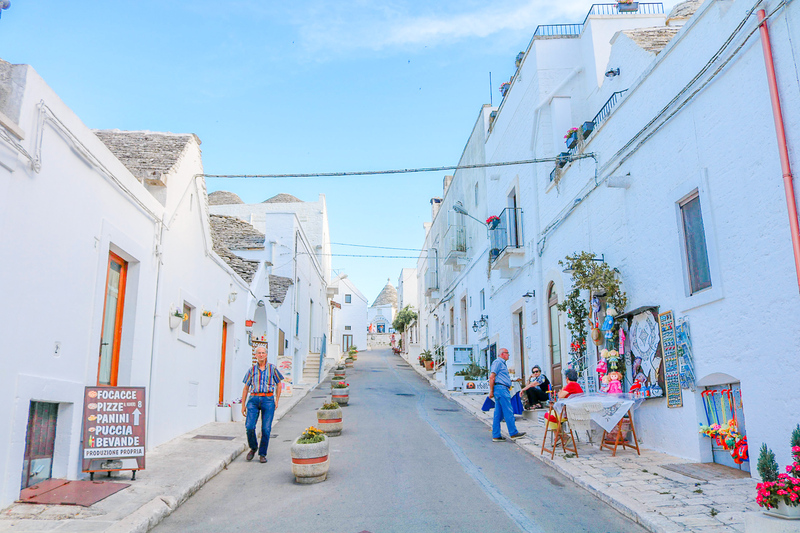 Alberobello is quite possibly the cutest Italian village ever. 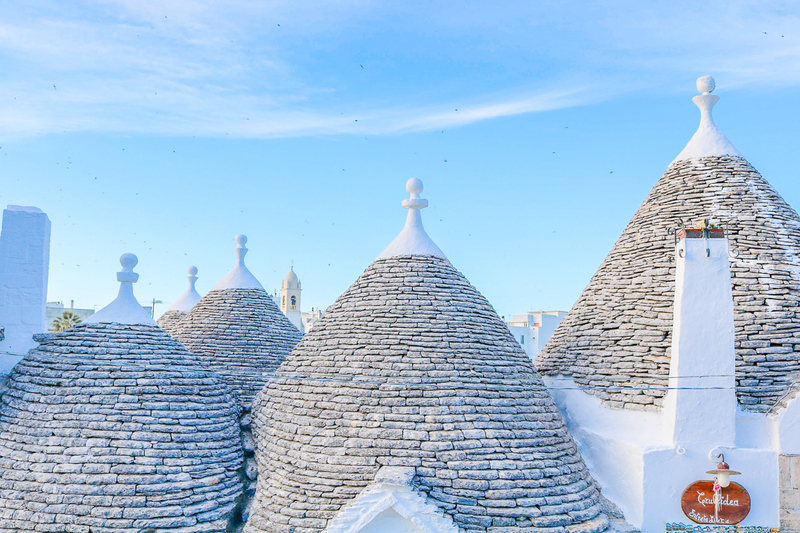 Here, the main style of dwelling is called a trullo (or trulli plural) which is a traditional stone hut with a cone-shaped roof. 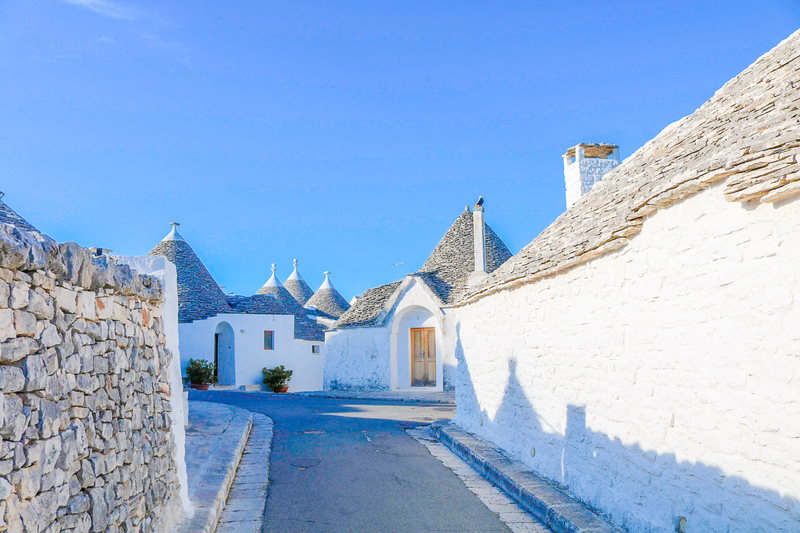 The trulli in Alberobello make up homes, hotels, shops, and restaurants, with a maze of hilly stone streets and palm trees in between. 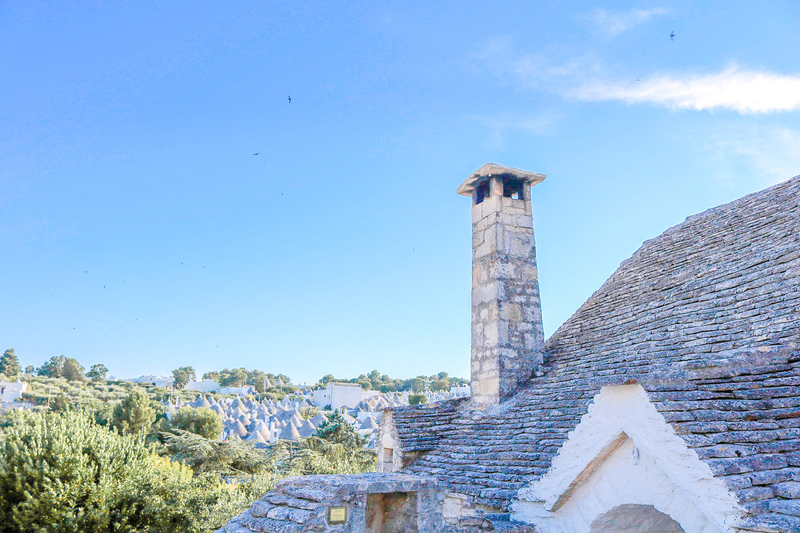 I was surprised to see how different the landscape in Alberobello was compared to Matera, as the two only an hour away by car. 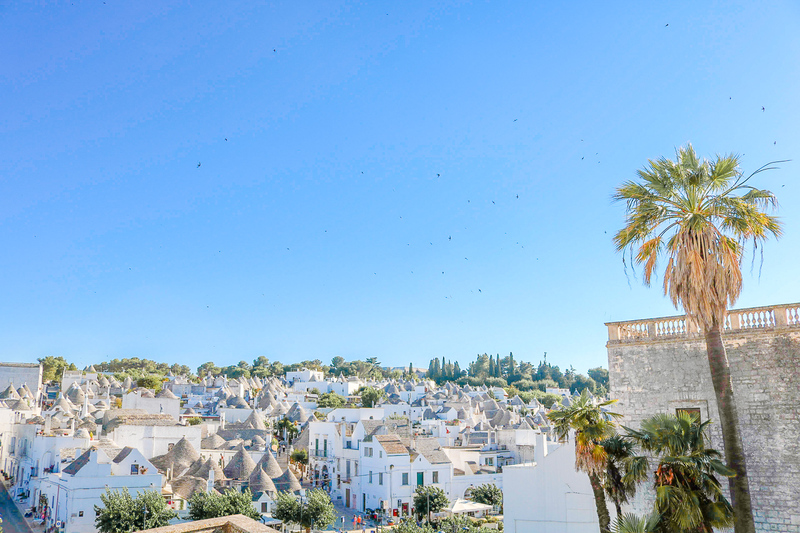 Alberobello felt much more Mediterranean and blue, making it my kind of town! As I mentioned in my last post, I needed a bit more time that morning to get myself together after my late-night hospital visit. I managed to get out of bed once I had racked up five hours of sleep, and was greeted by a tuktuk outside my door! I was working with the sweetest local producer who had accompanied me to the emergency room the night before, and she knew I might have trouble walking to our meeting spot that morning. So I got to ride in style, hanging out of the back seat of a teal tuktuk as we swerved through the town’s hilly roads. The first item of business for the day was to scout out a hotel that we could film and that our talent could stay at. As they were a family of five, we needed a big space, especially if the crew was going to be able to manoeuvre around inside as well. 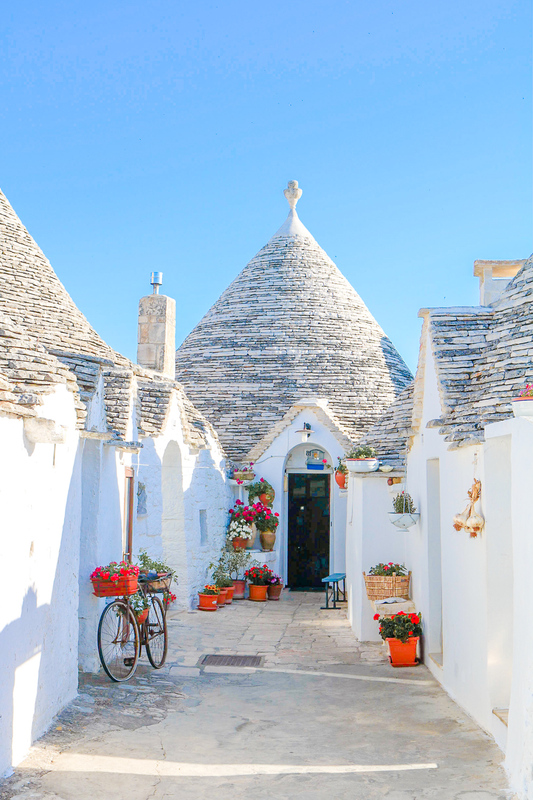 We saw a few places, but this spot was my first choice (and ultimately were we filmed) as the interior exhibited the traditional trullo style, and there was a dreamy patio out back where the family could enjoy breakfast together. If you watched the final film in my last post, you saw a scene where the family was sitting around this table outside. It was such a short, simple scene, but the effort that went into scouting out this location, and every other location in our film was considerate. For the production side of things, we have to test the light, work out logistics for the crew, think about parking, power, angles, lighting, and more. And as our film featured a real family wanting to travel together and enjoy a holiday, we also had to make sure everyone had comfortable sleeping quarters, the kitchen was fully stocked, the check in and check out times worked with our schedule, and so on. A lot goes into planning behind the scenes! 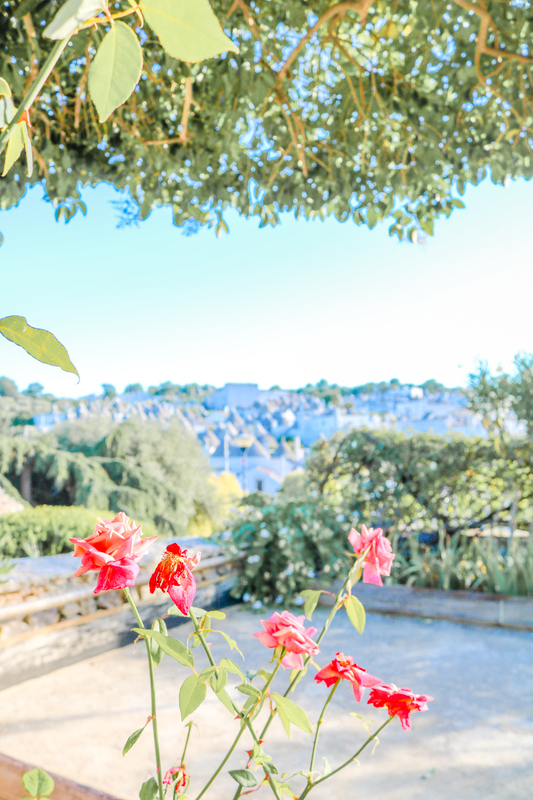 When I saw this dreamy back patio, I was sold and knew we had to shoot here:) If I ever have a garden, I will have a trellis with climbing vines, a picnic bench, and a stone pizza oven! We spent the rest of the morning walking around, scouting out other areas to potentially film – we had to prepare a list of locations including restaurants, vistas, and roads for our director. 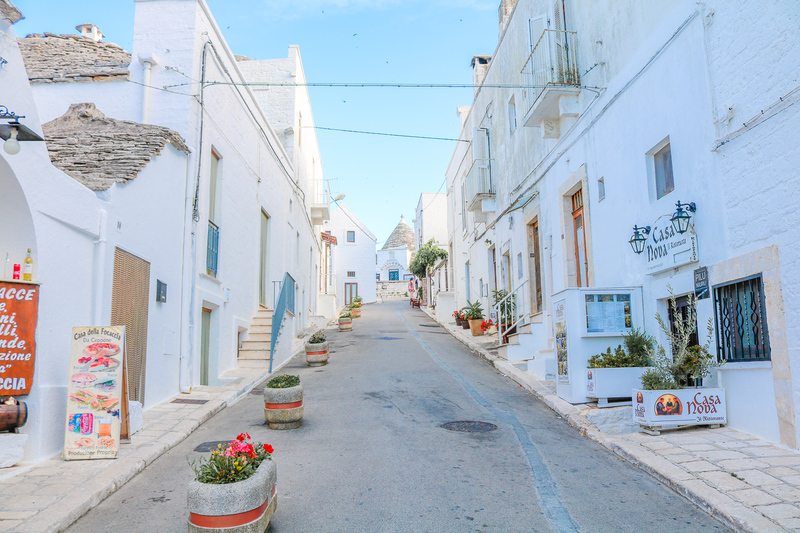 One thing I especially loved about Alberobello was the effort everyone went into maintaining the streets. Each home proudly displayed flowers or a bench outside. The streets felt orderly, green, and festive, with clay pots and tall flowers at every turn. In the afternoon, we made a trip into Matera to follow-up with some venues we weren’t able to see the day before. 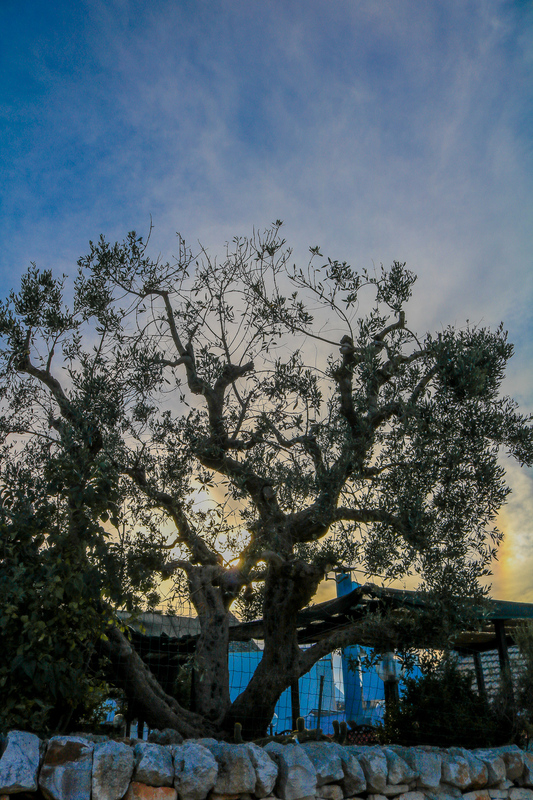 After another long day in the car, we returned to Alberobello as the sun was starting to dip around 7pm. I was happy to call it a day on the early side (often on productions we work quite late!) Even though I really liked the team I was working with, my body was screaming for an early night! I’d had at least four coffees that day (which is a lot for me!) and spent a good portion of my time hobbling around on a bum ankle. That said, in the evening I couldn’t resist venturing from my hotel room for dinner. 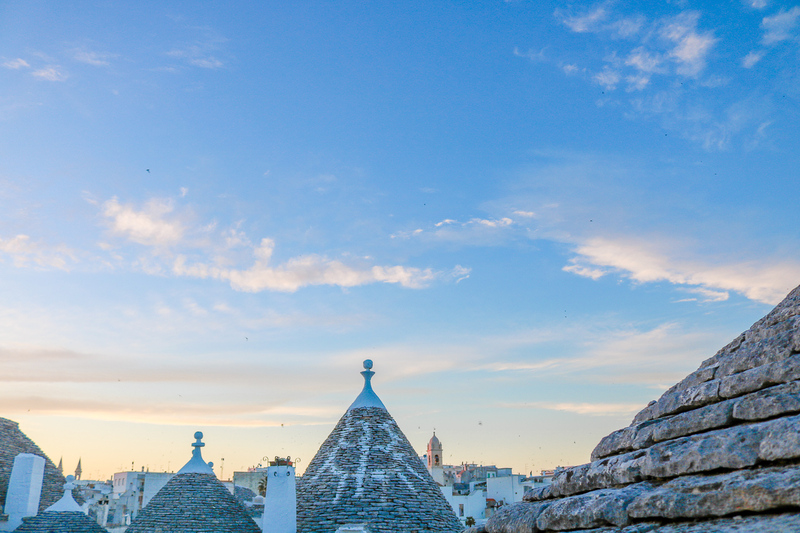 Alberobello looked so pretty with shadows cast from the early evening sun, so I set out for one final adventure of the day to enjoy the sun set and grab a big plate of pasta for dinner. When I opened my door, I was surprised to see two little visitors sitting outside across the road. I tried to walk over and introduce myself, but in place of a friendly hello I received a small kitten hiss. Which, let’s be real, was not a deterrent in the least as the little kitten’s hiss was equivalent to a lady bug landing on my finer. But I was respectful and gave them some space, and headed off to dinner. As I walked down the hill, into the town center, the views were so pretty. I found a quiet park where I enjoyed peace, quiet, and sunshine before dinner. Did your parents ever tell you not to hang out in parks at night?! That’s one thing I love about living in Amsterdam. The sun usually doesn’t set until around 11pm in the summer, so going on a solo late night stroll through a city park is hardly a worry. But as it got darker, I knew it was time to leave my bench and find some food. Which, after popping into a small mom and pop pasta shop, materialized in the form of a beautiful mozzarella salad . . . . . . and a creamy bowl of pesto! I emerged from dinner to the most beautiful light. This tree felt magical in the shadows of the sun. I slowly made my way up the hill to my hotel, and when I got there, something even more magical happened! An adorable little kitten was waiting there for me on the steps. To be fair, at first, he wasn’t very magical. He hissed and for a brief moment I was scared to step over him. But after a quick jump over him and a quick liaison with a box of salty crackers in my hotel room, we were best friends! And not long after, his little sister came inside to join as well! So, despite wanting to get an early night, I stayed up until well past midnight snuggling the smallest, cutest kittens ever. 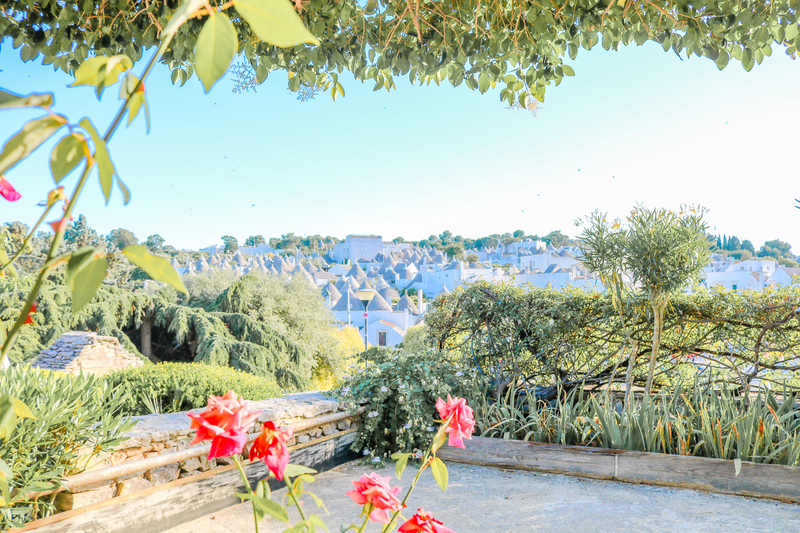 Just when I thought Alberobello couldn’t get any better! I’m sure heaven looks a bit like Puglia. Your photos are a dream!